Recipe: Mac & Cheese Stuffed Grilled Cheese | The Food Hussy! I love macaroni and cheese - like it's part of my food addiction - it's just my #1 food. So how did I make it even cheesier? So this year - I doubled down on the cheese and I think you can handle it! 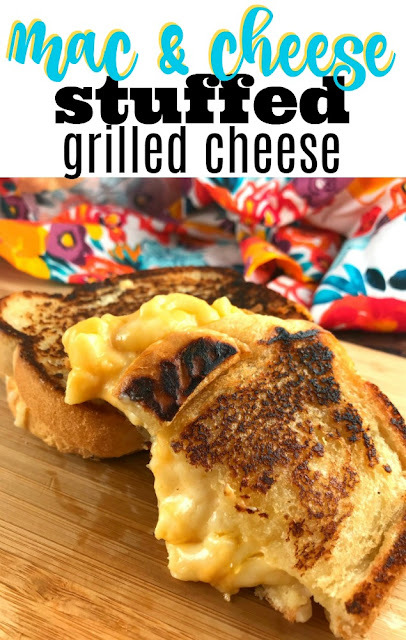 This was a super easy recipe too - you start with Sara Lee Artesano Bread - it's literally MADE for grilled cheese - it's thick and hearty but soft and delish! Then you layer on a great cheddar (I like sharp white cheddar) and pre-made macaroni & cheese (I used Bob Evans from the refrigerated section). A few minutes in the pan and dinner is ready! The cheesiest grilled cheese with a surprising crunch!